My thanks to you all! I’m blown away by how many of you filled out my survey. I’ll take time to crunch through those in the coming days, in the mean time today I have a new card to share and it is Day of Giving Friday. That means that I’ll be sending the card on to someone who responds today. But before that, let me acknowledge there is a winner. Please check my Giveaway Page then reach out with your mailing address through the contact tab in the upper right corner of the blog. Also welcome to new subscribers joining my blog readership – several of you sent sweet notes – thank you!! For the next couple of days, I’m going to be sharing a couple of feminine cards. Beginning Tuesday, January 26th I’ll be showing you glimpses of my new collection shared at CHA. The collection will be available in stores and online for purchase in March and keep your eyes peeled with retailers for preorder :-) I love the whole collection and had three demos at CHA. On day three, I had to revert back to my demo of the first day – by popular demand – I’ll share that make and take as well. As I’m given more definitive information, I’ll share it here. Ah, I have missed you!! If you are new to my blog, Day of Giving Friday comes out a desire to keep the handwritten word alive by our kind tradition of showering with handmade cards. The card shown will go to one of my sweet readers who leaves a comment today for more information, you can read about it on my FAQ List at #11 – just click the link. Today I’m sharing a card with an unexpected flower. This fall I received a die that was simply intriguing – Spellbinders Pinecones. (Seriously, click the link and have a gander and what the made version looks like as opposed to my flower!) Oh how I wanted to play with it. This fall was so busy that it passed me by and even though I didn’t make pinecones, I dreamed of how this sweet little die might look as a flower. We’ll what do you know! It makes a sweet, petite flower that simply gets curled around like all spiral flowers. So easy! And now I have a double duty die!! Otherwise this is a simple card that measures 5-1/2″ x 7″ with an actual card base of 5-1/4″ tall by 5-1/2″ wide. 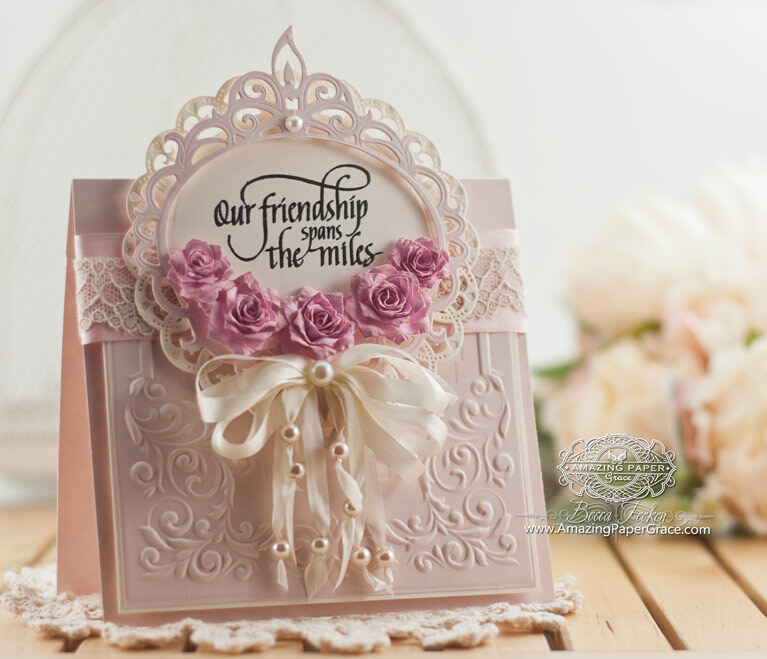 I layered Spellbinders Royal Circle on top of the main panel then added Spellbinders Majestic Oval as a frame for this fabulous ‘friend’ sentiment by Quietfire Design – In A Perfect World. 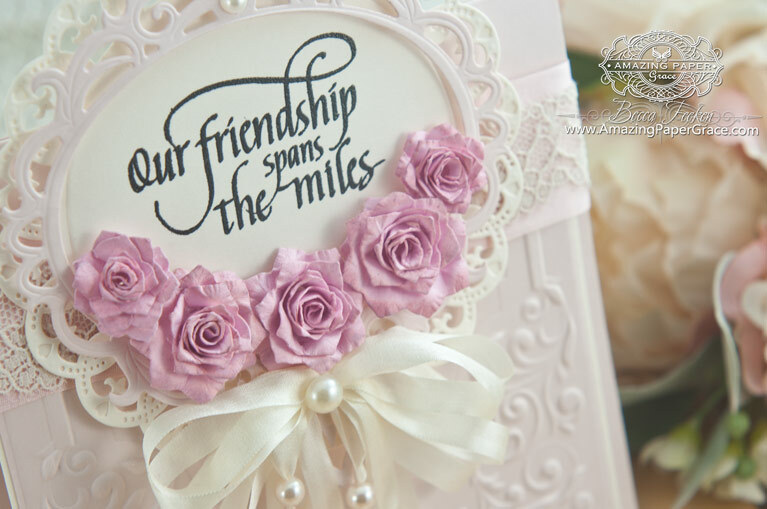 The lower part of the card is covered by a panel embossed with Spellbinders Shady Allure. For your comment today, tell us, what’s your ‘go to’ color for most of your handmade cards. I can’t say thank you enough for the information you gave me during my recent survey! Thanks so much for visiting – I’m so happy you dropped by! Sending a prayer to all those in the area of extreme weather – please take care! Becca this card is absolutely stunning! I love the soft colors and that pinecone/flower die does indeed make a beautiful petite flower! I love how cute they are and love the color too! I am so very happy that you were given a ton of feedback on your survey. 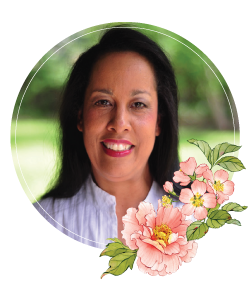 I hope that it helps you to explore many more avenues in your crafting and helps you to focus in on something that can potentially open up more doors for you. Feedback is always a great tool to help guide us along our path. And thank you for the well wishes! I am one of those people directly in the path of the major storm coming into the east coast. I live along the shore coast in NJ and I literally live right off the water. I have the bay in my backyard and the ocean four blocks up. We are expected to get between 6 and 10 inches of snow and then it is supposed to change over to rain. And add to that, very dangerous and high winds along with three high tides during the duration of the storm. We are already being told that this is the worst storm since Hurricane Sandy and we will be experiencing major to extreme flooding. I just pray that our power stays on and that the flooding does not become too severe that we would need to evacuate. So I do appreciate the well wishes and any prayers that you can send toward NJ’s coast. I hope you have a very relaxed and beautiful weekend. What a beautiful card and I still use so many of my old Spellbinders dies, they are so versatile. The Quietfire sentiment is perfect for such a ‘peaceful’ card such as this. Gosh ! what a beauty of a card such a delicate shade of pink ,i love it . My colors have been a lot of pink and brown ,however i do use a lot of white on white too. What a beautiful card, wow. Hi Becca. beautiful card, and fabulous flowers, will have to have a look at this die. Looking forward to seeing your new dies, if they are as beautiful as your last ones we are really in for a treat. Oh Becca, what a gorgeous card. Thank you so much for sharing your talent! I love all colors and use all colors. However, if I’m in a creative slump, a cream and blue combo always gets my mojo going. Hi Becca, beautiful card, and I really love the flowers, will have to have a look at this die. Really looking forward to seeing your new dies and it they are anything like your last ones we are really in for a treat. Wow Becca! What a stunning card!! So lovely!! I love all your cards. This one is really special. one of the conventions in this area. The color I go to is different shapes of blue. Beautiful! I had to hurry through the post to find how you made those flowers and voila, you told us how to use another die for multipurpose! My go to color is usually pale cream. I love white but sometimes find it too stark. Cream is so soft and lends itself to most any color I would accent with! I think this card is exceptionally pretty and love how the ribbons hang down with the pearls on them. I’m so glad I decided to follow your blog each card is an inspiration as are your kind and generous words to us all. S o happy to be hear and what a fabulous idea is the day of giving. I love all colors but I would have to say that I like pink, mauve or dark rose the most. What a wonderful card you have maked for this give away. And who would guess that the flowers are made with a pinecone die. My go to color is probably white. I have loved what you do with it & try to copy. Usually though I use a pastel pink, yellow, blue, or green with it. Can’t wait to see your new dies. I just (finally) got the ones I bought from Create & Craft & am very excited to use them. One of them is your flower dies & I am reviewing your videos showing how to use them. Good morning, Becca! Gorgeous card design; love! that you used the pinecone die to make roses. I can’t wait to try some of my dies as flowers. Yikes. ? I think my go to color is blue. For me, it’s an easy color to match with many others, depending on the shade I choose. WOW!! How stunning and beautiful!!!! What a nice surprise to find out that your die can be used as not only a pinecone but a flower too!!! I can’t believe this is a pine cone die. OMG those little flowers are beautiful. The card is beautiful. My go to color is normally a blue/green. Sometimes I can’t get away from it. What a fabulous card! I love everything about it and those flowers are stunning! I love so many colour combinations that it’s difficult to choose just one. White and lilac is a very popular duo with the group I host. We did white and pink with a dash of green today and last Friday, white and aqua. We’ll be moving to creams, yellows and golds in the next couple of weeks! I often use white and silver, maybe adding in a splash of another colour, depending on the recipient. Thank you for showing us your beautiful cards! What a lovely card! So stately…so you! Welcome back from CHA! I missed the post last week so I’m a little late with that greeting, but no less heartfelt. My go to colors tend to be greens and blues…all shades of them. When I display my cards for sale, I end up with a good visual of what I have been tending toward, so it keeps me from Using too much of the same color palette, which is helpful. When I make individual cards for family and friends, I use what I know they love. Again, good to see you back! Blessings, Becca. My go to colour is Aqua then Pink! Todays card is beautiful and whoever you choose will be delighted! I actually try to make my cards the ‘favourite’ colours of the person I am giving it to. When I play and do my own thing I am always drawn to pink and green and turquoise! What an exquisite card you have made today. Love the roses!! Oh, my ! I love these little flowers so much! This card is lovely, Becca. I can see why you made roses from the pinecone die. They are very pretty!! I do a lot of white on white. It looks elegant to me. Then sometimes just a pop of one color. Today’s card is absolutely gorgeous! Flowers are such a perfect design element. I encouraged you to design more flowers in my comment last week and I felt like “that girl doesn’t waste any time” when I saw this week’s post. Awesome! I must admit that I use cream or white card/envelope blanks for the majority of my cards. My design paper layer usually determines the other layers. I did give some thought to the color of solid card stock I buy and I use a lot of black, browns and rich greens. Since I started making cards, I pay a lot more attention to colors and the subtle variations. In trying to match a “cream” color – I discovered a Christmas paper I purchased had the faintest shade of pink – just fascinating. Becca, this card is so gorgeous! I love what you did with the pearls & ribbon. I do not really have a go to colour. It just depends on who I am makong it for & what the occassion is. What an absolutely stunning card, Becca. As usual, you have shown us such a Beauty! I don’t really have a “go to” colour – it depends on who I’m making the card for. I tend to go for blues and navies or browns and creams for male cards but for female cards, I try to go for the recipient’s favourite colours, with bright colours saved for children. Will keep you in prayer that you heal very fast. Oh my, my, my! Talk about a georgous card, this is it! Beautiful Becca! Another masterpiece. Boy would I ever love to have this one!!!!! My go to color is white on white (when appropriate). Otherwise, if I am making a card, I try to use the person’s favorite color in an attempt to make them happy. I personally love yellow, it reminds me of the sun and living here in Florida, love the sun. The card is lovely, I enjoy reading your posts, and trying to make your cards, my family and friends your cards. Becca – This card is so awesome. Who would have thought a pine cone die would make such sweet flower. I love how you used to pearls on the ribbon. Good morning Becca, first things first Congratulations to Patricia Murphy you lucky lady!!! Oh my what a simply stunning card!!! My go to colour depends on the recipient!!! and goes with most things . I just wanted to say that this card is gorgeous. I especially love the lace the you used. Becca, this is a GORGEOUS card!!!! It seems I have to focus on using other colors as I always reach for aqua – LOL! It is definitely a challenge, but I am enjoying it! This is another simply beautiful card flower and i do like your pine cone flowers as they look beautiful as such. I love the colours, the bow with all its loops and pearl ends, the dies that you have used to create this work of art and the beautiful sentiment that just says everything you want to say. Thank you Becca for your work of art that is pure joy to look at. What an awesome card here today again Becca, you just never disappoint and make beauty out of anything. I have no one go to colour, but I do use pink and blue tones a lot. Love your gorgeous card Becca. Well of course I missed yesterday, but couldn’t be helped. doctors appointment does take priority. Beautiful card I really like how you used the ovals and embossing together. thanks for sharing. Just ordered Shady Alure. I am not sure how that folder has managed to escape me. I know you have used it in the past and I loved it then, but this time, I made sure I had it added to my arsenal. LOL I also ordered the pine-cone die cause I love the flower you made with it. I like it better as a flower then a pine cone that’s for sure. I personally think that Tim Holtz nailed the pine cone that he came out with and it would be really hard to top that one. But, thanks to you you saved spellbinders by coming up with a totally different use for this die and it really makes an impressive flower. Way to go Becca as always.